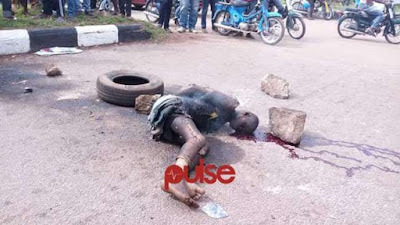 An unidentified young man was burnt to death today in Gboko, Benue state after he allegedly stole a three month old baby from a house at Bristow round-about in the aftrenoon. "We just heard the baby's mother screaming 'thief, thief' and we came out only to see the boy running with the baby,"
"Some boys in the area collected the baby and started beating him while the others were looking for tyre and calling more people to come out. "He was begging and crying but the other boys did not listen," the source added.